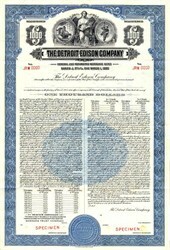 Beautifully engraved certificate from the Detroit Edison Company dated 1950. This historic document was printed by Columbian Bank Note Company and has an ornate border around it with a vignette of an allegorical woman, a generator and a man working on a power pole. This item is over 56 years old. Power generation The utility operates nine fossil-fuel generating plants, as well as the Fermi 2 nuclear power plant. The company also is co-owner with Consumers Energy Co. of a hydroelectric pumped storage facility in Ludington, Michigan. Detroit Edison uses coal to generate about 85 percent of its total electrical output, with the remainder produced from nuclear fuel and natural gas. At 3,300 megawatts, Detroit Edisons's Monroe Power Plant has the second largest generating capacity of any coal fired powerplant in North America. Only Southern Company's Bowen Power Plant located near Atlanta, Georgia has more generating capacity. Energy distribution Detroit Edison's near 11-gigawatt generating capacity is offered to its 7600-square-mile service area, which encompasses 13 counties in the southeastern portion of Michigan's lower peninsula. Energy is distributed throughout Huron, Tuscola, Sanilac, Saint Clair, Lapeer, Livingston, Ingham, Oakland, Macomb, Wayne, Washtenaw, Lenawee and Monroe counties by over a million utility poles and 44,000 miles of power lines. There are four 120KV interconnections with Consumers Energy. Since Consumers Energy's transmission voltage is 138KV, Detroit Edison has 120/138 KV transformers in the substations on their end of the lines so that they can tie into Consumers Energy's system. The 120 KV interconnections are the Custer-Whiting line, Genoa-Latson line, Hemphill-Hunters Creek line and the Atlanta-Thetford-Karn line.